Fostering a pet can be one of the most rewarding experiences. Since fostering involves bringing a pet into your home temporarily, it’s especially beneficial for someone who loves animals, but is unable to give one a permanent home. Fostering can also be a great way to teach children how to handle animals and help a family decide whether they are ready to commit to adopting a pet. How long will I be expected to foster? If it’s until a suitable home is found, how long do you expect that to take? What happens if I can no longer care for the pet? Who pays for medical bills if they arise? Does that include treatments for my pets if they catch something from my foster pet? What should I do if there’s a medical emergency? Who is responsible for communicating with potential adopters, screening them and introducing the pet to them? Will I be required to bring him/her to adoption events and, if so, where/when? Will you provide food, litter, supplies (such as a leash or a litter box), medications, etc., or will I be expected to? If I have a problem, whom can I contact? If I leave a message, how quickly will that person get back to me? Could my foster pet be deemed unadoptable and, if so, what happens then? Can I adopt him if I choose? All kinds of different pets are in need of foster homes. Here in Santa Barbara, the need is especially great for felines during the spring and summer months when young orphaned kittens and stray mom cats and their kittens need to get out of the shelter and into temporary foster homes. Animal Shelter Assistance Program (ASAP) has been operating a successful foster program since 1992. Hundreds of kittens are fostered each year along with at least a dozen mom cats and their litters. For more information about fostering for ASAP, visit asapcats.org. When you foster a homeless animal, not only are you helping to get that particular pet adopted, but you’re also freeing up space at the animal shelter for other animals in need. Every animal who goes into a foster home brings down the number of shelter pets euthanized each year. If you love animals and are unable to adopt one permanently, you can still make a difference by fostering. To find an animal shelter near you, visit petfinder.com. 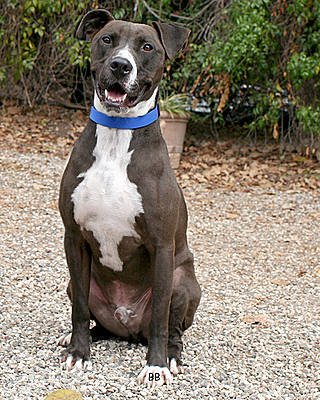 Marty is a three-year-old pit bull/Labrador retriever mix who is 57 pounds. He enjoys playing with other dogs! To view more photos and information on other dogs for adoption, go to the K-9 PALS website K-9PALS.org. K-9 PALS provides free dog behavior training sessions for people who have adopted a dog from any local shelter, rescue organization, or humane society. K-9 PALS (K-9 Placement and Assistance League, Inc.) is the all-volunteer, no-kill, non-profit 501C3 organization dedicated to providing humane care, forever homes, and advocacy for homeless and abandoned dogs in Santa Barbara County and beyond. All donations to K-9 PALS go directly to benefit homeless and abandoned dogs of our community in order to save lives, and find forever homes for them. Information on K-9 PALS is available at K-9PALS.org, or 805-570-0415, or info@k-9pals.org or at K-9 PALS, P.O. Box 60755 Santa Barbara, CA 93160-0755.